§ Or, what is time? This is not an easy question to answer. 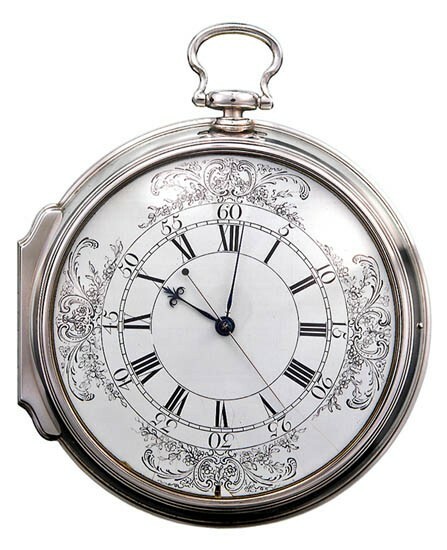 We all intuitively "understand time" by the clocks and calendars we invent to "measure it". In a sense, therefore, the concept of time is given an "operational definition" by these invented instruments which ultimately relate back to Earth's axis of rotation as well as its orbital transit about the Solar System's Sun. Perhaps a more elegant definition of time would involve the relative motion of objects [ or 'event - objects' ] such as the statement "this 'event - object' occurred before that 'event - object' " in a volume of human perceived 3 - d space. with permission from BBC's "Wonders of the Universe"
"... the system of those sequential relations that any event has to any other, as past, present, or future; indefinite and continuous duration regarded as that in which events succeed one another." Time is an accounting of the relative motions of bodies. And how we keep "score" is by means of human - invented clocks and calendars. Earth's "Latitude" was always a relatively easy concept to implement - it is an angular measurement in degrees ranging from 0° at the Equator to 90° at either pole ( 90° N at North Pole or 90° S at the South Pole ) described as parallel concentric circles girding the Earth. Earth's "Longitude" on the other hand are imaginary Great Circles, starting at Greenwich, England for 0°, running from north to south, pole to pole, and dividing Earth's circumference into 360 degree - units, going either E, east, or W, west. 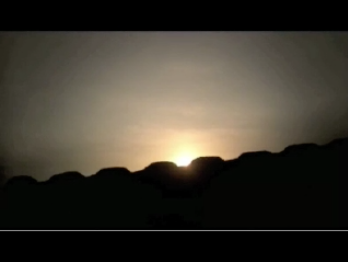 Also the Sun's high or "solar noon" is defined as that moment of daylight when the Sun reaches its zenith in the sky for the day. 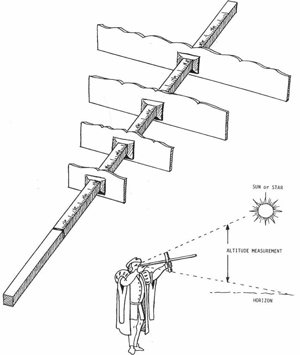 Because solar noon will vary according to season and latitude, there were developed several early instruments to determine approximate latitudes. One such early instrument was the "Cross - Staff" first described by the medieval Jewish astronomer - scholar Levi ben Gersohn about 1330. 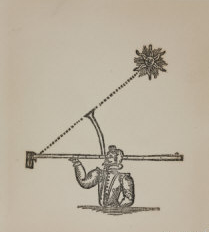 The "Backstaff" was invented by Captain John Davis in 1590 and operated essentially the same as the Cross - Staff to determine latitude except that the navigator's back was to the sun and thereby avoided eye damage. And by 1771 the first edition of Encyclopedia Britannica published what was already known to scholarly navigators, namely that 1° of longitude at the equator represents a steadily decreasing value of nautical miles as degrees of latitude increase towards either north or south poles. Here then is all the mathematics necessary to associate time with distance traveled! 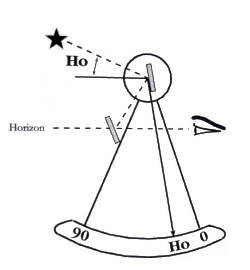 In other words, a clock placed at Greenwich, England for 0° Longitude and set to 12 noon and matched exactly with a second clock before being placed on board ship, the ship's navigator will therefore identify the amount of time displacement at each daily 12 noon observation of the Sun together with an adjustment necessary for the observed Latitutde, and voîlá! 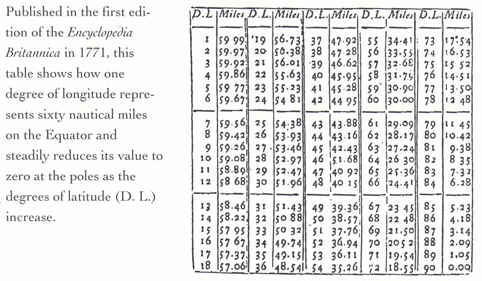 Time of longitude, adjusted for latitude, and hence converted to longitudinal distance traveled!! That is, by taking an onboard clock reading when the sun is exactly overhead, supposedly at noontime, the amount of "time ( or clock ) slippage" is then translated into longitudinal miles, east or west! All that was finally necessary was for someone to devise such a clock. 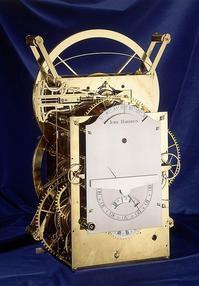 Although not predating Kepler's, Giovanni Cassini's or Olaf Roëmer's use of the concept of time and its related clocks, one of the most prescient inventions of the modern world was John Harrison's H-4 clock-watch since it relates the idea of time with space - distance. By the Longitude Act of July, 1714, during the Queen Anne Reign, a Board of Longitude was established offering a prize of £20,000 for a method or technique to determine longitude to within a 1/2 degree of an Earth Great Circle, north to south, equivalent to ≈ 30 nautical miles or 2 minutes of time going east to west or vise versa. 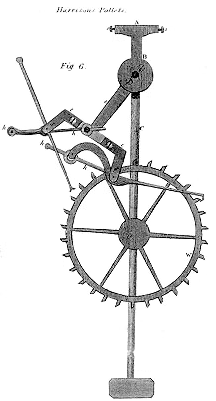 The Grasshopper Escapement, invented early by John Harrison for his 1725-26 wooden clocks, is a control device for the calibrated timed release of a clock's stored driving power and as a substitute for the messy and poor quality oily lubricants only available during Harrison's lifetime, he used Lignum vitae, a very hard self lubricating wood, in the bearings, which made the Grasshopper Escapement almost frictionless! 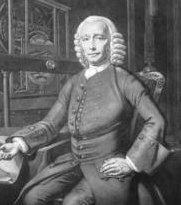 Afterwards, John Harrison switched to finely polished brass and his other major inventions were a bi - metallic temperature compensator and enclosed or caged bearings as well as other "regulators" and "compensators" for sea rolling ( i.e., circular balances ), humidity, salt, etc. for long earth circumnavigating sea voyages. 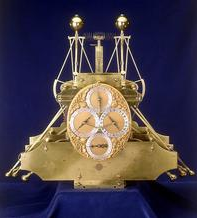 John Harrison finally won the Longitude First Prize of £20,000 with his H-4 after having unbelievably and successfully completed both the First Trial Voyage, 1761- 62, to Port Royal, Jamaica and back to Portsmouth, England, and again in the Second Trial Voyage, 1764, to Bridgetown, Barbados and returning back again to Portsmouth. In the duration of the First Trial Voyage, H-4 lost only 1 minute 54.5 seconds in total sea-time of which H-4 only lost 5.1 seconds on its 81-day initial outward bound voyage; and in the duration of the Second Trial Voyage H-4 gained only 54 seconds with an average error of 39.1 seconds on the outward bound voyage. In both of these voyages John Harrison's H-4 clock - watch revolutionized sea navigation, solidified England as a world sea power able to place men and guns at precise time and locations on the Earth, and fully demonstrated the merging of time with space - distance! Or, rudimentary spacetime. Voîlá! The H-4 requires re-winding every 30 hours, hence daily. It utilizes anti - friction wheels and enclosed or caged bearings both of which require extremely careful oil lubrication approximately once every 3 years. "The clock, not the steam engine, is central to the industrial revolution. 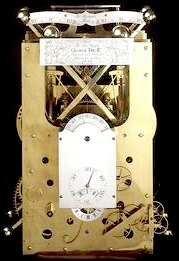 The clock is the crowning achievement that all other machines aspire to."